Born 28 November 1948 in Orcheston, Wiltshire [registered in Salisbury, December 1948]. Married to Dorothy J. Madcroft [registered in Winchester, June 1972]. Height/Weight 6' 0½", 12st. 4lbs . 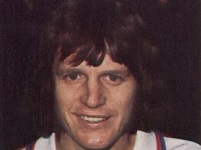 Player number One of four who became 882nd players (885) to appear for England. First match No. 464, 11 October 1972, England 1 Yugoslavia 1, a friendly match at Empire Stadium, Wembley, London, aged 23 years 318 days. Last match No. 515, 7 September 1977, England 1 Switzerland 1, a friendly match at Wembley Stadium, Wembley, London, substituted (ht), aged 28 years 283 days. 9 u23 7 June 1972 - USSR U23 0 England U23 0, Kiev Central Stadium, Kyiv Fr AD sub 75 ?